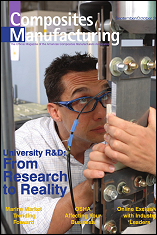 Composites Manufacturing magazine featured the Clark School Composites Research Laboratory in one of its university research vignettes, in its September-October 2011 issue, on the morphing aircraft skin technology currently under development in Dr. Wereley's Composites Research Laboratory. Mr. Robert Vocke III, a graduate student in Dr. Wereley's research group, is developing Elastomeric Matrix Composites (EMCs) that are capable of large area changes, even doubling their skin area during aircraft wing morphing. For more details, please see page 21 of the September-October 2011 issue at http://www.cmmagazineonline.org.